Looking to find the perfect hair style for fine hair? Here are a few tips and tricks of the beauty trade to get your roots plumped and pumped in no time flat. Fine hair encompasses a whole range of hair types. Having fine hair does not necessarily mean you have less hair. Some people have lots of fine hair on their head, giving the appearance of full hair with a texture that is lighter and smaller in diameter. Others struggle with thinning, fine hair. Hair is measured by the diameter of the strand. Thick hair has a large diameter, where fine hair has a very small diameter. Before your next cut, seek a professional stylist's opinion so that you can find a hair style for fine hair that fits and flatters your needs. When you've been blessed with fine locks, you know the daily challenges of styling and searching for a hair style that works for you while adding the desired body you crave. These tips will help you obtain lift and fullness. Work a Bang: Side swept bangs are in style and work wonders on fine hair. Ask your stylist for a push away bang to add volume to your style while hair is tucked behind the ear, and to add interest to your cut as it frames your face. Say No to Layers: No hairdresser should talk you into layers if you have fine hair. Although layered hair styles can add tons of body when styled correctly, layers can be the kiss of death on fine hair types. Ditch the Straightening Iron: Say goodbye to Sedu hair styles and hello to hot rollers! Fine hair can certainly take the heat, but why iron out flattened locks? Plump your tresses with good old fashioned hot rollers and ditch the iron for good. Bleach It: Hair color works wonders on fine hair. The peroxide used to open the hair cuticle swells the hair shaft, otherwise known as fattening it up! If you've got fine hair, bleach and hair color will be your best option for long term thickening. Now's the time to experiment with color. Get Body: Fearful of color or bleach? Why not opt for wavy locks? A body wave or perm will add texture and volume to your hair, all while making styling a breeze. There's no such thing as a bad hair day when appropriate styling products are put to good use. Rather than reaching for the ball cap and incognito sunglasses, keep a ready stash of these styling products and plump up those fine strands in minutes. Texturizing Tonics: Love beach hair but have no beach? Time to spritz on Bumble and Bumble's Surf Spray texturizing beach spray. Adding endless volume and fattening the hair, textured hair is bottled with this amazing stuff. Volumizing Sprays: Goodbye wimpy locks and hello volume! Volumizing sprays and sealers worked into the hair shaft prior to heat styling can really add some wow factor to fine hair. Blow Dry Styling: You know that famous little attachment that came with your blow dryer? Well, most people mistakenly toss this little plastic treasure -- otherwise known as a directional nozzle -- right in the trash. This act may just top the list of beauty crimes! Everyone, especially fine hair gals, should use a directional nozzle each and every time they blow dry their hair to direct the air flow where you need it. The best way to blow dry fine hair types is bent over at the waist. Tip head upside down and blow dry until hair is dry. Brushes: Unless you're going for super straight locks, there's really only one type of brush you'll need to style and add body to your fine hair. Consider a round brush such as Spornette's nylon and boar bristle brush for volume boosting power. 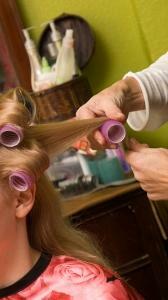 Hot Rollers: Hot rollers can infuse the hair with lift and body. Prior to setting, spritz dry hair with a volumizing tonic. Set hair, allow rollers to cool thoroughly, spray with a firm hold hair spray and finger through the curls for maximum volume. With some styling time, practice, and a few prized beauty products, fine hair can challenge thick locks any day of the week, and you will have no problem finding the right hair style for fine hair to suit your mood and preferences. .